The attacks on Thursday are believed to be retaliation for the seizure of 22 kilograms (48 pounds) of methamphetamine by the municipal police. An alignment forged by “La Línea” and “Los Mexicles” carried out the retaliatory attacks, according to the Ciudad Juárez Mayor Armando Cabada Alvídrez. The street-level distribution of methamphetamine by criminal street gangs working for warring drug cartels has been blamed for the spike in cartel killings in this border city. “Los Mexicles” previously operated as the armed wing of the Sinaloa cartel — a deadly rival of “La Linea” or El Nuevo Cártel de Juárez. Cartel gunmen carried out a total of six attacks on elements of the municipal police on Thursday leaving eight officers wounded. Two of the officers are reported to be in critical condition. Additionally, at least two other attacks were carried out earlier in the week leaving two police officers dead, according to Mayor Cabada Alvídrez as reported by local media. 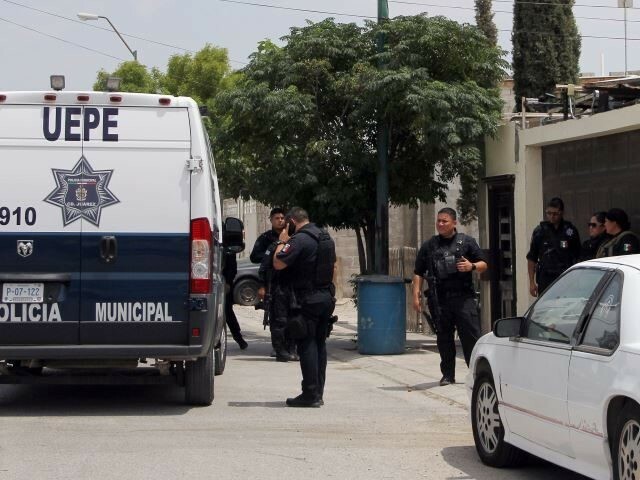 The first of the six attacks on the municipal police of Ciudad Juárez began at 2:53 p.m. at El Principio and Puerto Cádiz streets. Five cartel gunmen opened fire at the home of a police commander leaving three police officers wounded. Police later arrested the five gunmen. Gunmen previously attacked the residence of this same police commander in October 2018. The second attack occurred at 3:16 p.m. at the intersection of De las Torres Avenue and Zaragoza Boulevard. The attackers shot a female police officer who is currently listed in critical condition. The cartel alliance reportedly carried out the third attack in the downtown area at 3:40 p.m. when gunmen opened fire on a police officer who was guarding a business at the intersection. The same officer arrested a 16-year-old female he found to be in possession of a cell phone containing a message with instructions to kill him. At about 4:50 p.m., cartel gunmen carried out the fifth attack when they opened fire on the Municipal Police Station in the eastern district. The attack injured four police officers who were assigned to guard the facility. The fifth attack occurred at 7:23 p.m., officials reported, when gunmen opened fire on a location in the Distrito Poniente located on Avenida De los Aztecas. Fortunately, no police officers were injured in this attack. The sixth attacks were carried out about a half-hour later at the intersection of Justo Sierra and Ramón Rayón Streets in the colonia Salvárcar. A cartel gunman opened fire on a police unit at that location. The officer was not injured and one suspect was arrested. Breitbart Texas reports regularly on the escalation of cartel-related violence in the area known as the El Paso-Juárez Metropolitan Border area — to include a previous security alert issued by the U.S. Department of State following a marked increase in homicides throughout the city.